failure event:  fail != 0 & fail < . The estimated coefficients are similar to those obtained using a Weibull model. Here's a side by side comparison. Recall that R uses the AFT metric, so we need to convert to PH to compare. For example the Cox coefficient for blacks indicates that African Americans face a 48.6% higher risk of recidivism at any duration since release from prison than non-blacks with the same observed characteristics. The Weibull analysis yielded an estimate of 51.3% higher hazard. Let us compare all available methods of handling ties. If you run this code expect the exact calculation to take substantially longer than the others. 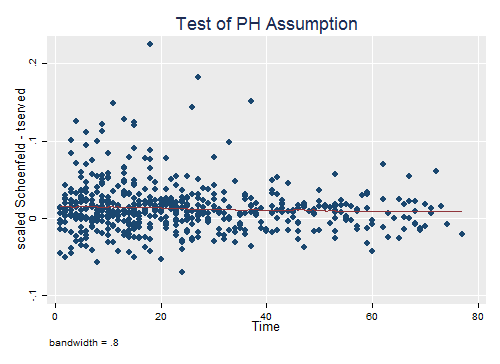 As is often the case, the Efron method comes closer to the exact partial likelihood estimate with substantial;y less computational effort, although in this application all methods yield very similar results. After fitting a Cox model we can obtain estimates of the baseline survival or cumulative hazard using extensions of the Kaplan-Meier and Nelson-Aalen estimators. Estimates of the hazard itself, which may be obtained by differencing the estimated cumulative hazard or negative the estimated survival, are usually too "spiky" to be useful, but can be smoothed to glean the general shape. Stata makes these calculations extremely easy via the stcurve command. By default the command computes the baseline hazard or survival setting all covariates to their means, not zero. You can request other values via the options at(varname=value). Below I plot the hazards for blacks and others with all other variables set to their means. To make sure you understand exactly what Stata is doing under the hood I also do this "by hand". In R we can obtain the survival via `survfit()`, which accepts a Cox model as argument. You are encouraged to always call this function with a new data frame that specifies exactly what you want to calculate. The default is the mean of all covariates used in the Cox fit. Below I calculate the means explicitly and construct a data frame with two rows, representing blacks and others with all other variables set to their means. I then compute the survival, and difference the negative log to obtain the hazard. The estimates suggests that the hazard raises a bit in the first few weeks after release and then declines with duration. This result is consistent with the observation that a log-normal model fits better than a Weibull. We now check the proportional hazards assumption using scaled Schoenfeld residuals. Recall that our software uses different defaults so results will differ. Stata computes the test using the original time scale. 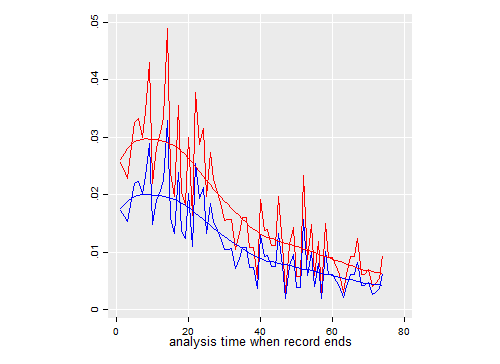 R computes it using the overall survival function as the time scale. We specify transform = "identity" to obtain exactly the same results. The overall chi-squared statistic of 12.76 on 9 d.f. indicates no significant departure from the proportional hazards assumption. The only variable that might deserve further scrutiny is time served, which has the largest chi-squared statistic, although it doesn't reach the conventional five percent level. 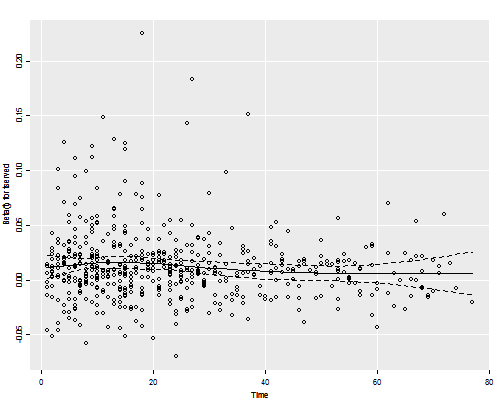 Just out of curiosity we can plot the scaled Schoenfeld residuals against time. To do this we use the plot(varname) option of stphtest. 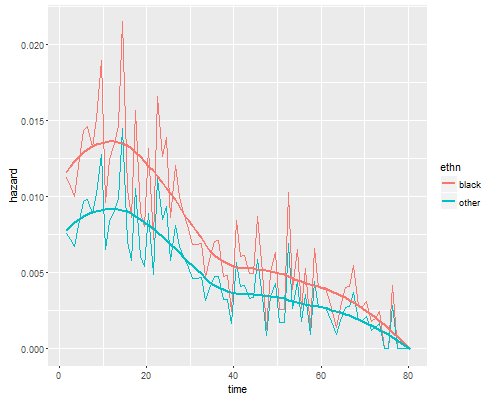 we use the generic plot() function. By default this plots all covariates you can use an index to specify the target of interest. We see no evidence of a trend in the effect of time served, so we have no evidence against the proportionality assumption. More detailed exploration of this issue can be pursued by introducing interactions with duration, as we demonstrated using Cox's example.